Hi Techies, In this post we will discuss Huawei Nexus 6P Specifications, Price, Features & News. The Huawei Nexus 6P sports a Octa Core Snapdragon 810 CPU, 5.7 Inch Quad H.D display (518 P.P.I pixel density). Talking about the design, it has a uni body design made of Aluminium, Dual front ported speakers, USB Type C port & a fingerprint sensor at the back. Corning Gorilla Glass 4 protection on screen. 5.7 Inch Quad H.D display. (Resolution 1440 x 2560 pixels). Uni body design made with Aluminium. Android Marshmallow out of the box. CPU/GPU Octa-core (1.8 GHz Quad Core A 57 And 1.5 GHz Quad Core A 53) Qualcomm M.S.M 8994 Snapdragon 810 Chip sets. | GPU Adreno 430. DISPLAY 5.7 Inch Quad H.D A.M.O.L.E.D Display. 1440 x 2560 pixels (~518 p.p.i pixel density). CAMERA REAR 12 MP. Resolution 4608 x 2592. Auto focus with LED flash. | Features: Touch focus, optical image stabilization, face/smile detection, panorama, H.D.R, Geo-tagging. | Video Features: 2160 p @ 30 F.P.S, 1080 p @60 F.P.S, H.D.R recording | FRONT/SELFIE CAMERA 8 MP. FEATURES Fast battery charging: (Quick Charge 2.0).). | Corning Gorilla Glass 4 Protection. | Fingerprint Sensor. The Nexus 6P is launched in India in two variants i.e. 32 GB & 64 GB. It is exclusively available at Flipkart. The 32 GB Model is priced at 39,999 Rupees in India. The 64 GB Model is priced at 42,999 Rupees in India. The Limited Edition Huawei Nexus 6P 64 GB Gold will be Available from 21st December in India for 43,999 Rupees. 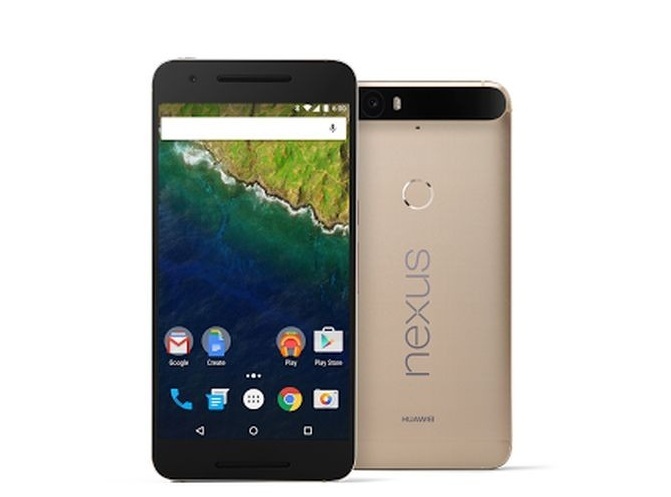 Wanna Buy Huawei Nexus 6P (Flipkart Link) <– Check Here.